Book on line save money 20% discount. Do you feel bored? You don’t want have another lazy day? Have three activity pack!!! 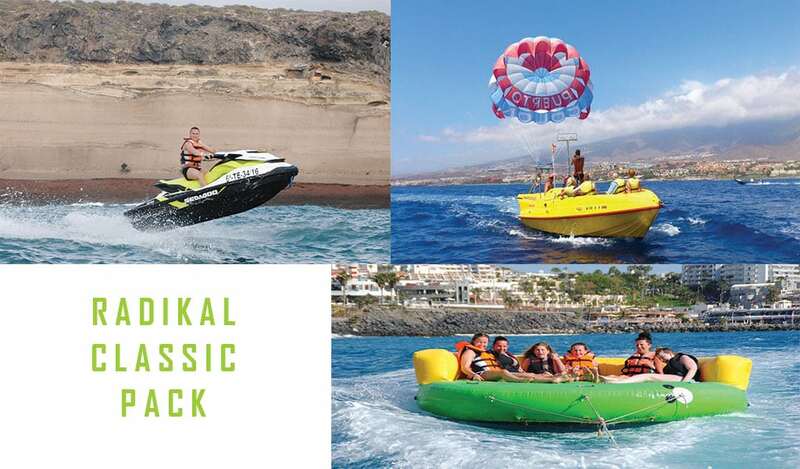 With this pack we offer three activies, 40 minutes jet ski safari, 10 minutes parascending and 10 miutes crazy ufo. In this pack you can choose between 10 minutes parascending, or 1 hour rent a boat. You can buy this pack in single version and you’ll drive alone the jet ski, or you can share the jet ski with your friend or your partner. The minimun age to drive is 16 years old and you can drive only alone. 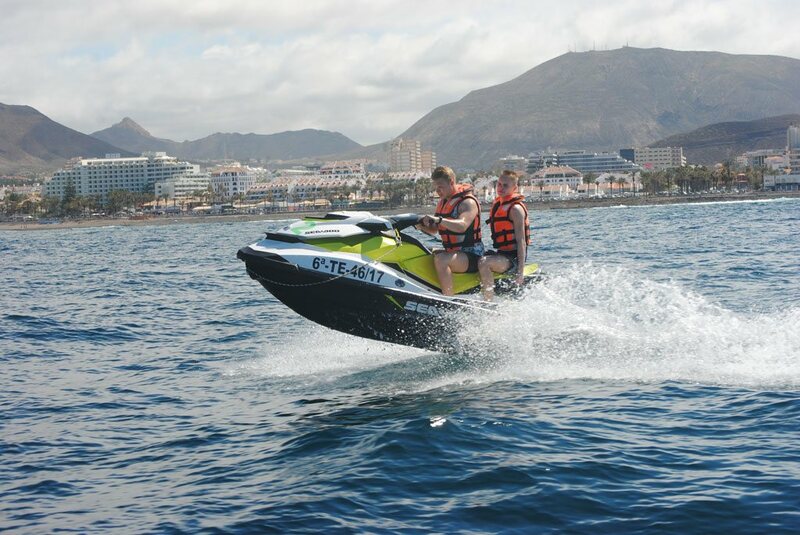 If you feel the need to refuel in the sun, here is an exciting new experience to try.With the jet ski you will discover a natural virgin site where nature still owns all rights. 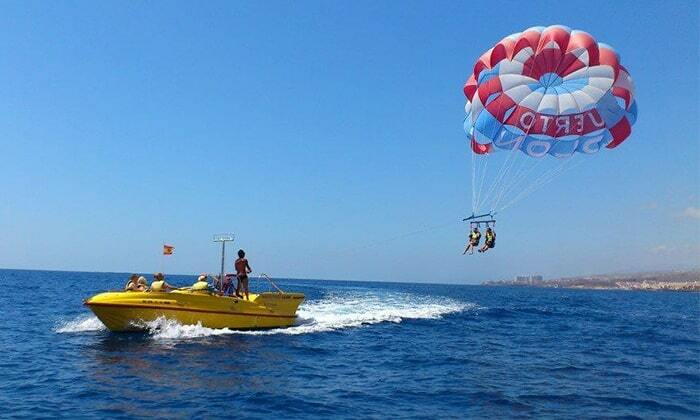 Fly from 100 meters high and enjoy the wild life of Tenerife from the sky to finish flight a dip in the water. On board can go maximun 4 adults, and 2 smalls kids, we’ll give to you, life jacket, waterproof bag, emergency kit, and we explain the map, so that you can enjoy at maximun your experience. Fuel and insurance are included. Save your money only for on line booking now 20% discount. Radikal classic pack, single version, normal price 120 €, only on line 96 €, double version, normal price 140 €, only on line 112 €. 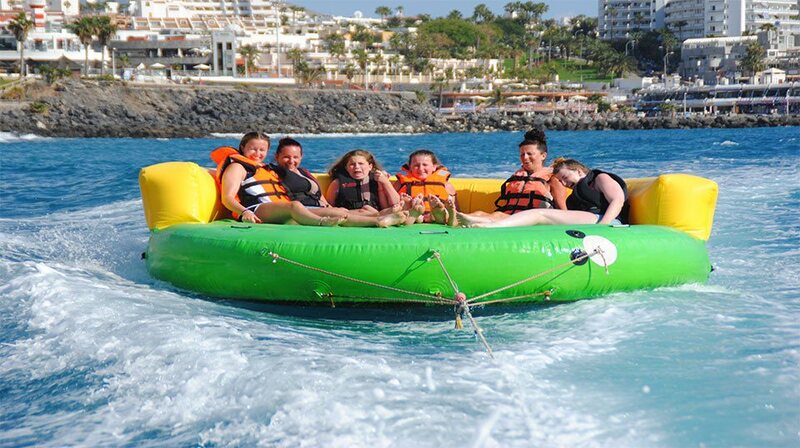 With this pack we offer two activities, 40 minutes jet ski safari to “La Caleta”, where is the “Hippies beach”, and 10 minutes parascending for fly at 100 mt over the south coast of Tenerife. In this pack you can choose between 10 minutes parascending, or 1 hour rent a boat. 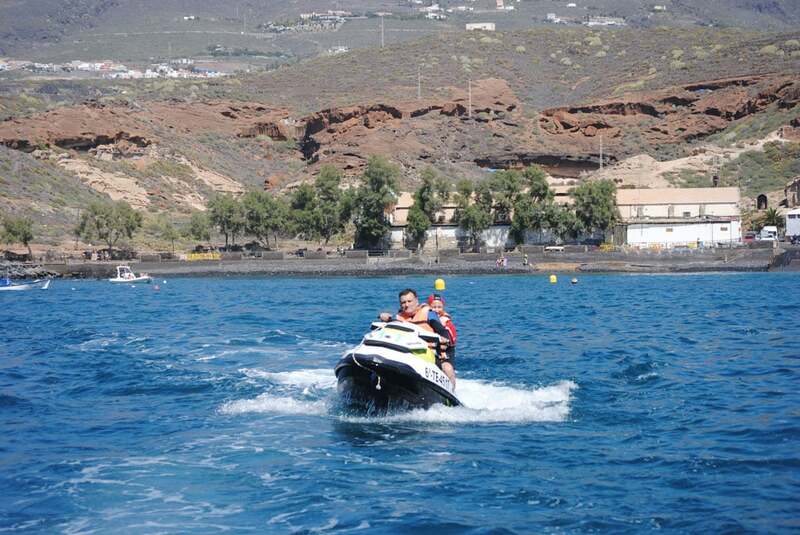 Join us on the jet ski safari along the coast of tenerife south on board of our seadoo gtx, and drive to “La Caleta”, where is the “Hippies Beach”. Enjoy a unique experience! Feel the wind and be pleased with the panoramic view of the Tenerife’s south coast.It is very exciting and appropriate for anyone. You don’t need experience or a special uniform. Save your money only for on line booking now 20% discount. Double pack, single version, normal price 100 €, only on line 80 €, double version, normal price 120 €, only on line 96 €. 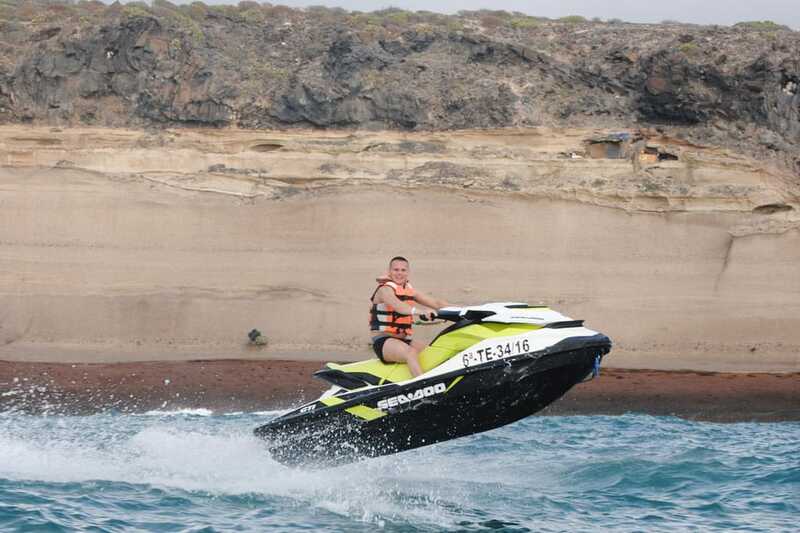 With this pack we offer two activities, 40 minutes jet ski, and we’ll drive you to “La Caleta”, and 15 minutes fly board, the new sport that has revolutionized the watersports. This pack is only for one person. 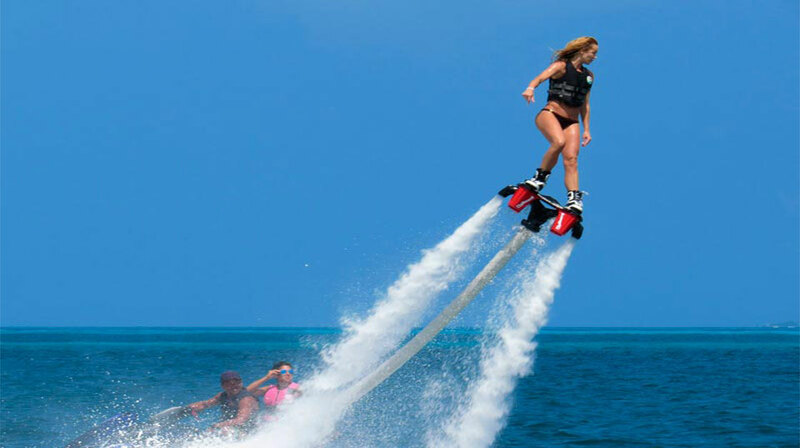 The Flyboard is a newest watersports apparatus which allows propulsion underwater and in the air.We have professional equipment and professional instructors, and they provide to expalin to you the right technique so that you can fly by your first time. Save your money only for on line booking now 20% discount. Jet pack, normal price 100 €, only on line 80 €.